2. Nalcor Energy, St. John's, NL, Canada. The underexplored Chidley Basin off the Labrador coast of Newfoundland Labrador, Canada is being investigated for oil and gas prospectivity after new seismic data acquisition. 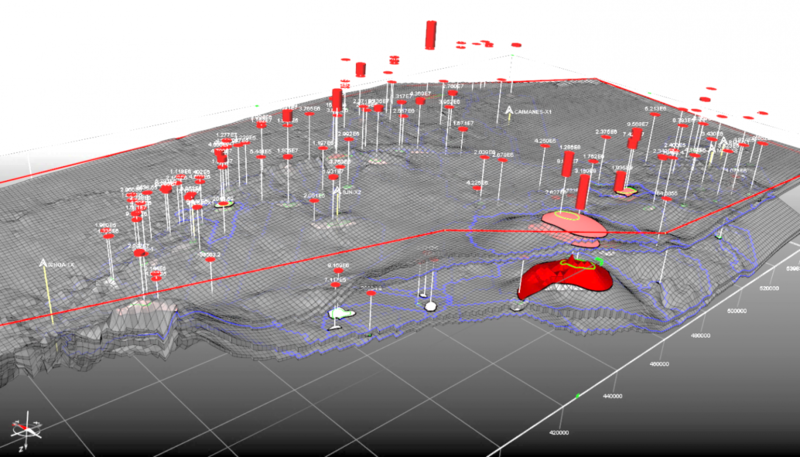 We present here how the geology and geophysics data were integrated into a comprehensive 3D stratigraphic model which allowed the play elements of a potential petroleum system to be tested. Regional geodynamic and sequence stratigraphic work facilitated the understanding of the basin architecture and infilling through the Labrador sea opening and transform fault zone activities. This provided the inputs of Gross Depositional Environment maps that ultimately enabled a forward stratigraphic model (DionisosFlow™) to be built. This forward numerical model simulates the stratigraphic record of the basin through calibration of well record and integration of seismic data. The model helps to resolve the extension of known, hypothetical, and/or speculative source rocks, reservoirs, carrier beds and seals at the basin scale. 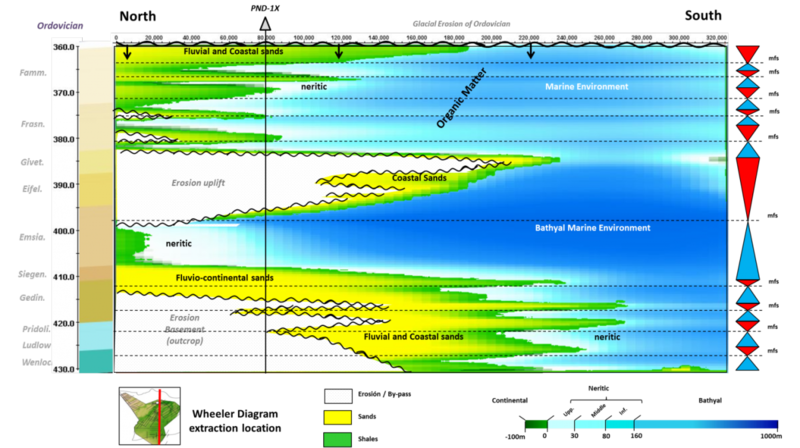 Based on this regional stratigraphic understanding, the source rocks, reservoir, and seal presence seven main plays in the basin were identified, defining a complete petroleum system that shall be now tested offshore in the light of the past shelf discoveries. The petroleum systems of the Bolivian basins have been revised under the light of a fully integrated regional study. The stratigraphic review, including biostratigraphy, sedimentological core description and seismo-stratigraphic investigations led to new consistent tectono-sedimentary models and allowed the identification of several conceptual plays. The geochemical synthesis coupled with the stratigraphic study allowed a better definition of the potential source rocks. The thermal calibration of the temperature and maturity data is only possible by taking into account an increase of the heat flow during Triassic-Jurassic times. Two main phases of hydrocarbon expulsion are calculated. The first began in Triassic-Jurassic time and the second was contemporaneous with Andean deformation and associated foreland basin. 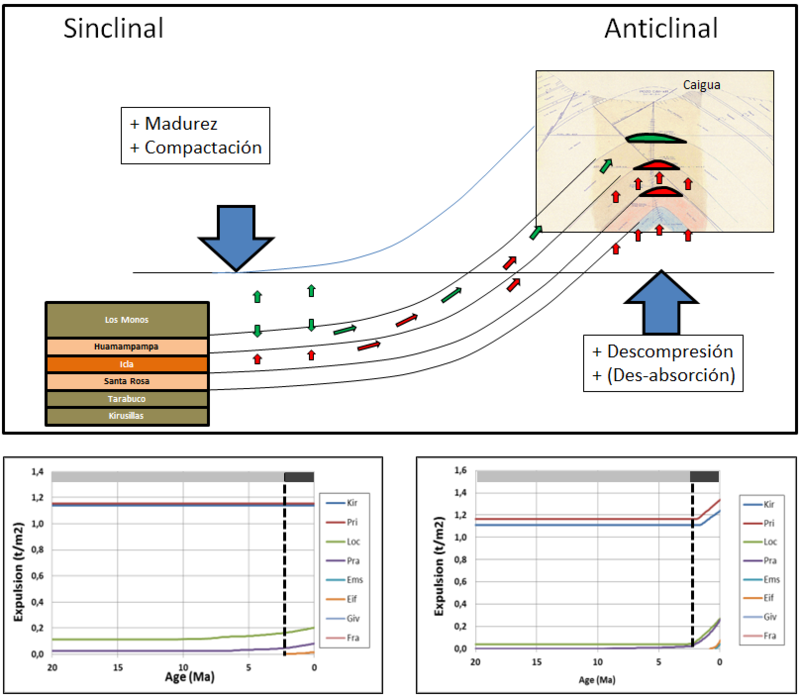 During the Andean phase, the hydrocarbon charge of the sub Andean traps is controlled by expulsion in the synclines and in the anticlines. Mechanical expulsion related to burial is the main expulsion mechanism in the synclines sometime associated with increase of maturity. In the anticlines expulsion occurred due to the hydrocarbons volume expansion during uplift. Stratigraphic and sedimentary processes simulation to explore . . . The gas-condensate field, object of this study, is located in the Sub-Andean compressive zone. The structure is a typical faulted asymmetric anticline, 60km long, 5km across. The Devonian sandstones constitute the reservoir. Tests have shown the existence of a developed fracture network. The reservoir is a classical type 2 fractured reservoir: the fractures provide the permeability (15-70mD) while the matrix provides the porosity (2-6%). These characteristics make the fracture study a key element to understand the field behavior in order to maximize the production and anticipate possible issue like water-breakthrough. The BHI of 5 wells were analyzed and interpreted. Depending on the quality of the images, fractures crossing the wellbores can be picked. As induced fractures or artefacts of various origins can be easily confused with natural fractures, a quick analysis of core pictures was performed to minimize uncertainties. The output of BHI analysis is a log of fractures for each well. While the previous static data bring information regarding fractures at well, seismic data bring inter-well information allowing the detection of the major thrust-faults of the field. Faults and fracture logs along with other logs were then imported in the dedicated software FracaFlowTM for analysis and modeling. From the BHI analysis output, the number of fracture sets can be determined as well as their density and their possible relationships with facies, porosity, volumes of shale… This allows understanding the spatial organization of the fracture network. In this case, a clear relationship between the fracture density and the distance to faults was highlighted. However, the understanding of the contribution of fractures to the fluid flow requires dynamic well data: mud-losses, PLT, well-test and production data were thus carefully analyzed. By computing locally the equivalent permeability of the fracture network, FracaFlowTM calibration algorithm found the optimal fracture conductivity to match the KH interpreted from well-tests. All the equivalent properties (permeability along x/y/z, porosity and shape factor) were finally computed with a dual-media hypothesis. This study allowed building a fracture network, consistent with the geological context and matching the dynamic data. It is now ready to be used for the history matching and simulation/forecasts. Petroleum Systems Modeling and Hydrocarbon Charge Assessment . . .
An active petroleum system is recognized by producing fields in Boomerang Pie de Monte foreland basin in stratigraphic up-dip and structural traps of Silurian-Devonian and Cretaceous formations. The area is considered as one of the most prolific gas provinces in Bolivia. However, the timing of hydrocarbon expulsion and migration versus trap formation remains unclear as confirmed by dry wells showing low gas shows of residual by-passed hydrocarbons. To reduce this uncertainty, we built a basin model that honors seismic structural interpretation and well data to simulate burial history, temperature, source rock maturity and pressure regimes through geological time. Hydrocarbon expulsion from source-rocks and further HC migration was simulated using 3D basin fluid flow modeling based on Darcy flow equation, followed by a map based fetch area trap charge assessment. The main source rock units correspond to Silurian-Devonian sequences with influence of continental-marine environments (kerogen Type II/III). Maturity trend increases from north to south due to higher burial. Two phases of hydrocarbon expulsion were recognized: one early expulsion phase from Silurian source rocks during Late Triassic and a second expulsion phase from Early Devonian source rocks during Late Jurassic-Early-Cretaceous times. Lateral long distance up-dip migration through Robore formation occurred before Andean deformation, following a northward fill and spill trap charge accumulating below Late Jurassic erosive unconformity. The Cretaceous plays were charged by vertical and lateral migration above the unconformity. The Andean deformation resulted in enhancing the structural closures and vertical migration towards Cretaceous plays. The results of this study provided to YPFB a model based approach to predict yet to find volumes in place for undrilled prospects and leads and a proposition for a future drilling strategy. A New Kinematic Tool for Petroleum System Modeling in Complex . 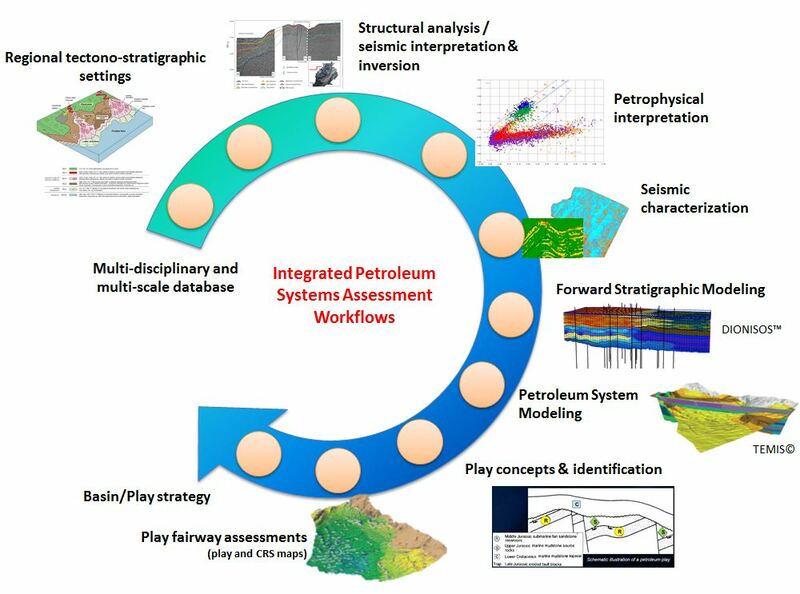 . .
Petroleum system modeling is today recognized as a critical step in exploration workflows. However, fold and thrust belts are typical regions where classic basin modeling tools do not accurately manage the combination of lateral and vertical tectonic displacements. These complex areas where hydrocarbon expulsion from source rocks can be prior or simultaneous to compressive tectonics require more accurate modeling approaches integrating active faulting, folding and fluid flow. The basin burial and geometry reconstruction, fault connectivity and fluid movements should thus account for the actual horizontal deformation through time, which is impossible with a regular backstripping approach. This work introduces a 2D kinematic tool specifically designed to meet this objective. 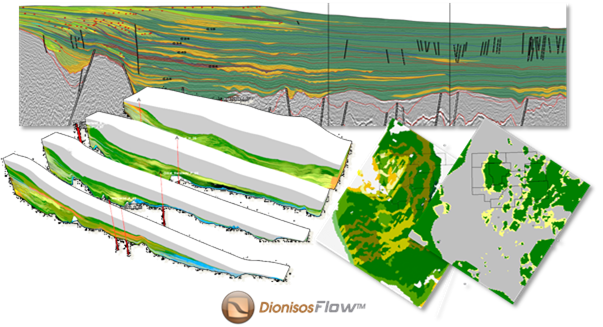 Starting from present day section digitalization, KronosFlowTM aims at producing rapidly consistent geological scenarios for basin modeling purposes. The first challenge of this approach is related to the number of restoration steps to provide as basin modeling requires a detailed kinematic scenario with, at minimum, a basin geometry at the end of each simulated layer deposition. Combining several geometrical and mechanical methods, the tool thus focuses on ergonomics to enhance productivity and afford multiple scenarios testing. The second challenge is linked to the mesh preservation through time that we believe essential for mass balance. In this regard, a new meshing technology has been developed to track sediments deformation while being compatible with a simulator able to take advantage of an accurate description of the basin evolution through time. Running on unstructured meshes and accounting for lateral displacement, this basin simulator uses the produced kinematic scenario for the forward simulation of heat transfer, pressure, hydrocarbon generation, migration and accumulation. Faults impact on fluid flow is assessed through an implicit modeling of the gouge and damage zones properties through time. An application case from the Andean foothills illustrates the applicability of these new technology and workflow. Preliminary structural reconstruction work detailing the main deformation phases of the area is used to guide the complete kinematic scenario made of more than fifteen steps. Forward basin simulation is then run and the model, calibrated to available well data, allows testing the impact of thrusting on maturation, migration pathways and hydrocarbon charge and quality. Several scenarios are elaborated, contributing to reduce the exploration risk. Probabilistic attribute derived from Pre-stack seismic inversion . . .
Probabilistic attribute derived from Pre-stack seismic inversion and characterization for prospect identification into Boomerang area. In the prospect evaluation work performed in Boomerang area, the uncertainty on the estimation of the hydrocarbon occurrence derived from seismic data has been a major importance in the exploration of this area. For this purpose, a dedicated workflow using Interwell™ and Easytrace™ integrating geological, petrophysical and seismic data has been applied to constrain petrophysical property distribution using elastic inversion. Initially, a detailed petro-elastic analysis was performed on the well near the prospect in order to define the relationships between petrophysical properties and elastic parameters (P and S velocity). Then, the available pre-stack seismic data were inverted using a stratigraphic inversion methodology prior to be used in a discriminant analysis to predict the presence of hydrocarbon and the probability associated. 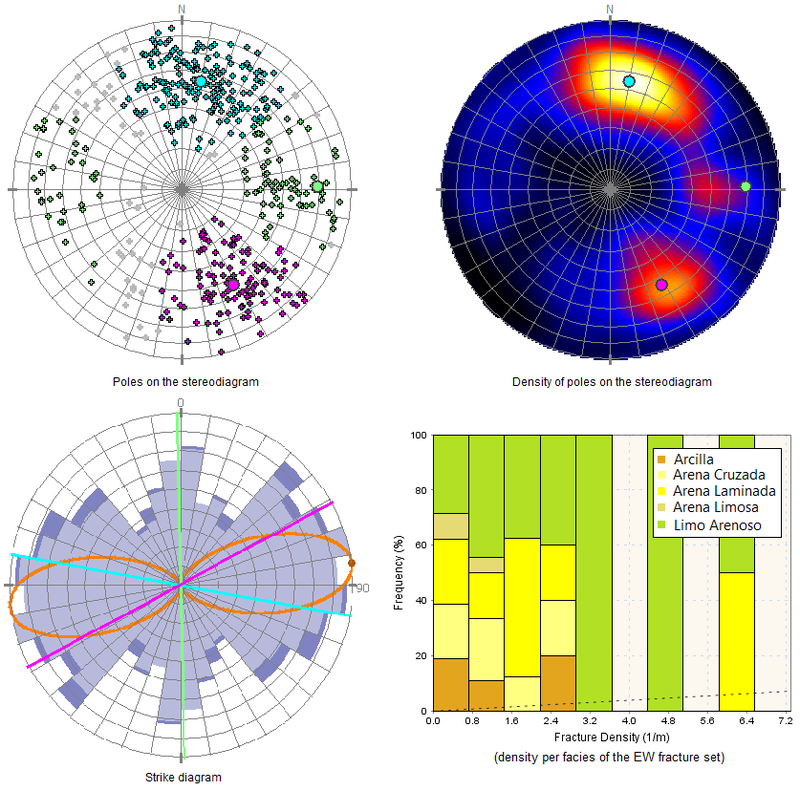 Therefore, both software provided a solution combining seismic inversion and seismic characterization to predict specific seismic facies distribution (including HC bearing facies) and associated probabilities for the entire seismic grid. The probabilistic attribute was helpful to evaluate the geological chances of success for finding HC in the prospect. The Importance of Evaluating Initial Kerogen Potential and Restoring . . . Evaluation of initial source rock potential is usually challenging for lack of suitable samples: source rocks may be mature everywhere and/or organo-facies changes complicate extrapolations at basin scale. Consequently, although it is critical to obtain a good estimation of generated HC quantities, explorationists often use analogs and neglect this task. 1/ Detailed analysis and filtering of pyrolysis data along with SARA. Identification of different maturity trends on HI vs. Depth and HI vs. Tmax plots (preliminary evaluation of HI0). Estimation of a “minimum TR” through amounts of free hydrocarbons. 2/ Estimation of S20, HI0, TOC0 and checking geological and geochemical consistency of proposed HI0, hydrocarbon mass balance, correlation with Tmax and VRo data. At this step basin modeling helps to assess absolute maturity levels. 3/ Available kinetic schemes restoration. “Missing” and “partially consumed” activation energies can be identified. Rebuilding of the full spectrum is constrained by assumptions made on HI0 and by calculated TR. Hypotheses are validated if TR vs. VRo and HI vs. VRo trends obtained with restored kinetic schemes are consistent with observed data. Computed Tmax are also calibrated (HI vs.Tmax , TR vs. Tmax, and VR0 vs. Tmax trends). 4/ Finally hypothesis on HI0, TR, and “missing” activation energies are adjusted to a compromise explaining all observed features. The calibration is confirmed through basin modeling. 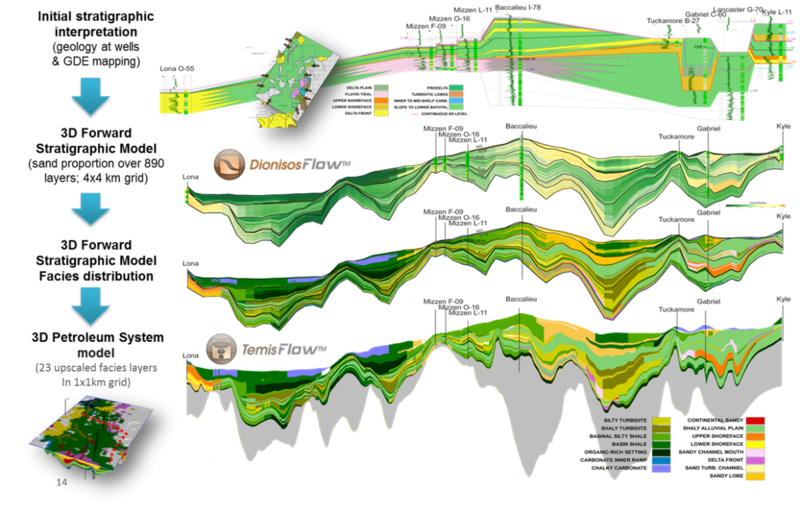 This workflow reduces uncertainties on source rocks behavior in basin models, better constraining maturity timings and volumes of generated hydrocarbons, which is invaluable for exploration of both conventional and unconventional petroleum systems. In this particular case study, careful integration of all available data allowed a more consistent assessment of initial kerogen states (S20, TOC0, HI0) and transformation ratios (TR). Finally the study demonstrated that the source rock potential was significantly underestimated: what was believed to be an early mature type II-III source rock was in fact a mature type II-IIS, much more prolific, which led to the reevaluation of the yet-to-find in the basin. Submarine fans in tectonically active continental-slope basins are targets of petroleum exploration and production. These slope fans commonly comprise compensationally stacked sandy and muddy architectural elements, including mass-transport deposits, weakly confined to distributary channel-and-lobe deposits, and leveed-channel deposits. The lateral continuity and vertical connectivity of these architectural elements are important uncertainties in reservoir characterization that influence fluid-flow behavior during hydrocarbon production. Here, we use a simple forward stratigraphic model to reproduce the large-scale stratigraphic patterns and illuminate the likely distribution of finer-scale, sub-seismic heterogeneity in a slope fan. We used three-dimensional seismic-reflection data (~40 Hz dominant frequency) in the tectonically active Columbus basin, offshore Trinidad, to document the Pleistocene stratigraphic architecture and evolution of a submarine fan across a stepped slope profile. Isochron maps of the fan show a pattern of compensational stacking of deposits; we interpret that sediment-gravity flows avoided pre-existing mass-transport-deposit topography, and formed compensationally stacked channel-and-lobe deposits. Once the stepped slope profile was healed by deposition, a leveed channel promoted bypass of sediment to the Atlantic abyssal plain. We then evaluated our interpretation of compensation with a series of DionisosFlowTM forward stratigraphic models. All variables were kept constant during the simulations in order to test the hypothesis that the evolution of the surface topography alone, as a result of erosion and deposition, can produce the compensational-stacking patterns interpreted in the seismic-reflection data. A reference-case model generally matches the thickness trend of our seismic-stratigraphic interpretation; it also produced similar large-scale patterns of compensational stacking and depocenter evolution. However, varying the time step impacts the heterogeneity of the model. Shorter time steps are characterized by less sediment accumulation, which results in less sediment diversion during the subsequent time step, more gradual migration of channel deposits, shorter offset distances of depocenters, and shorter length-scale heterogeneity compared to longer time steps. Thus, a key characteristic of slope-fan deposits is compensational stacking, which governs heterogeneity in these reservoirs. Furthermore, our results suggest that relatively simple diffusion-based models can produce realistic compensation patterns. 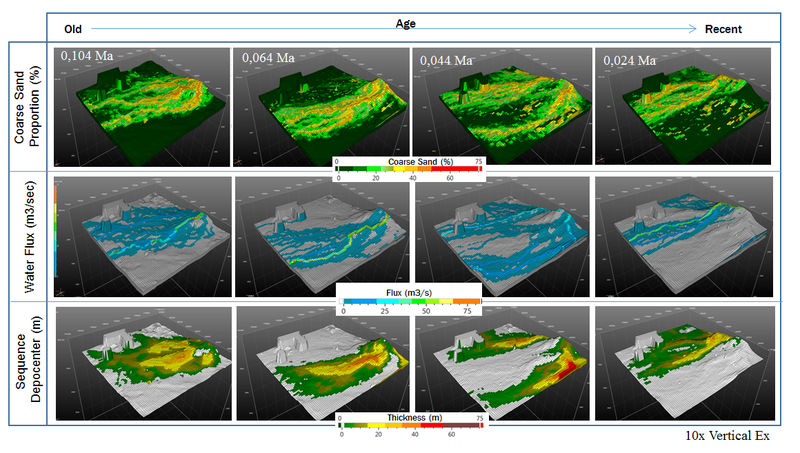 The impact of environmental parameters on the architectures and connectivity of sedimentary bodies and reservoir facies is later tackled through experimental designs and automated multi-simulations. Encouraging results point to the need for more integrated reservoir characterization workflows that comprise high resolution sedimentology, seismic characterization and forward stratigraphic modeling. Fold and thrust belts are typical regions where classic basin modeling tools do not accurately manage the combination of lateral and vertical tectonic displacements. These complex areas where hydrocarbon expulsion from source rocks is prior or simultaneous to compressive tectonics require more accurate modeling approaches integrating active faulting, folding and fluid flow. The basin burial and geometry reconstruction, fault connectivity and fluid movements should thus account for the actual horizontal deformation through time, which is impossible with a regular backstripping approach. We here introduce a 2D kinematic tool specifically designed to meet this objective. Starting from present day section digitalization, it aims at producing rapidly consistent geological scenarios for basin modeling purposes. The first challenge of this approach is related to the number of restoration steps to provide as basin modeling requires a detailed kinematic scenario with, at minimum, a basin geometry at the end of each simulated layer deposition. Combining several geometrical and mechanical methods, the tool thus focuses on ergonomics to enhance productivity and afford multiple scenarios testing. 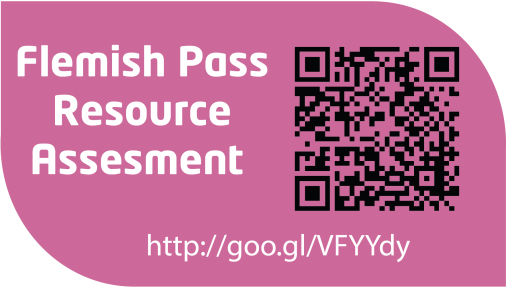 The second challenge is linked to the mesh preservation through time that we believe essential for mass balance. In this regard, a new meshing technology has been developed to track sediments deformation while being compatible with a simulator able to take advantage of an accurate description of the basin evolution through time. Running on unstructured meshes and accounting for lateral displacement, this basin simulator uses the produced kinematic scenario for the forward simulation of heat transfer, pressure, hydrocarbon generation, migration and accumulation. Faults impact on fluid flow is assessed through an implicit modeling of the gouge and damage zones properties through time. An application case from the Kurdish foothills illustrates the applicability of these new technology and workflow. Preliminary structural reconstruction work detailing the four main deformation phases of the area is used to guide the complete kinematic scenario made of more than twenty steps. Forward basin simulation is then run. The model, calibrated to available well data, allows testing the impact of thrusting on maturation, migration pathways and hydrocarbon charge and quality. Several scenarios are elaborated, contributing to reduce the exploration risk. Prediction of hydrocarbon composition and fluid phase behavior, in function of dew and bubble points, is essential to appraise shale play resources and delineation of recoverable sweet-spots. Sweet-spot detection is based on shale play fairway analysis in order to identify areas with significant retained hydrocarbons in-place but also specific fluid behavior at reservoir conditions (close to critical point) optimal for liquid-rich maximum recovery. For this purpose we developed a customized household compositional kinetic model for hydrocarbon generation coupled with 1D PVT reservoir fluid modeling (Peng Robinson EOS) for detailed fluid phase behavior properties. The defined kerogen and the associated source rock type fractions react as a function of thermal stress throughout primary and secondary cracking, being possible to quantify the compositional yields (mole fraction) of in-situ retained gas and liquid fractions. Hydrocarbons in-place at reservoir conditions were estimated by net source rock thickness organic porosity development, taking into account the generation of immobile fractions during secondary cracking. Calculated mole fractions and reservoir conditions (P-T) were used as inputs for PVT modeling to predict fluid phase diagrams as a function of critical point and to create maps of volumetric properties such as Bo, Bg, initial GOR and CGR. Volumetric factors maps were used to quantify hydrocarbon volumes in place at surface conditions. Finally, based on existing production data and forecast profiles (using adapted Arps equation); it was possible to define recovery factors to map recoverable resources in MMstbl/km² and Bscf/km². This workflow has been applied using public data from the Lower and Upper sections of the marine organic-rich Vaca Muerta Shale Play in the Neuquén Embayment. Calibration with production data comes from developed YPF’s Loma Campana concession block. Results provide a precise position of fluid type limits and detailed PVT properties in less developed areas for volatile oil and retrograde gas condensate windows. Higher potential of recoverable liquid-rich sweet-spots are located in areas where fluid behavior at reservoir conditions is near the condensate-volatile oil limit, close to critical point. Herein ultimate recoverable oil and gas resources vary from 0.7-1.1 MMstb/km² and 3.0-6.5 Bscf/km² Detecting recoverable sweet-spots provides, thus, a significant step forward for shale resource assessment and bidding block ranking. Pore pressure prediction in the Gulf of Mexico remains critical for exploration and development of hydrocarbon resources locked in deep and variably pressured reservoirs. This is especially true in areas dominated by salt tectonics, facies heterogeneity in terms of low permeability versus porous and permeable rocks, and connectivity of porous and permeable rocks both laterally and vertically. Society of Exploration Geophysicists Advance Modeling consortium has developed a compelling and realistic earth model to understand in detail critical mechanisms that drive the pore pressure distribution in the Gulf of Mexico. Structural restoration of complex allochthonous and autochthonous salt bodies has proven to have an impact on the overall mechanisms that affect pore pressure, such as disequilibrium compaction and lateral fluid transfer as well as secondary modification of shales properties. Heat flow and thermal conductivity through time and in the presence of salt not only impacts smectite to illite transformation depth, resulting from natural distortion of temperature isolines but also affects the timing of the transformation. The objective of the study was to sample the solution space for a number of uncertain parameters affecting a simulated pore pressure. Analyzed parameters are: simulated grid size, constitutive laws for compaction and fluid flow, illitization and fault permeability. The geological history, salt geometry evolution through time and differential sedimentation rates are additional drivers for the pore pressure. Comparison of a scenario with no clay diagenesis and proposed salt geometry reconstruction simulation shows overpressure variation of up to 30% at the units away from the salt canopy and less than 5% below the salt, which is explained by the thermal conductivity of the salt and its impact on the illitization process. As a consequence of thermal cooling generated by salt emplacement, water replacement during the illitization process is not as aggressive in the salt surroundings. On the other hand, it is substantially away from the salt body. This phenomenon combined with the hydraulic connectivity of the facies, generates unique overpressure trends controlled by a rather large number of variables that can be fully investigated by a 3D full-physics forward basin modeling. The results of the modeling were blind-checked with the overpressure profile from a well in the Gulf of Mexico, proving outstanding calibration on similar geological settings. From basin-scale exploration to field-scale production . . . This paper was prepared for talk at International Meeting of Sedimentology 2017 held in Toulouse, France, 10 - 12 October 2017. With the huge amount of multi-disciplinary and multi-scale datasets gathered along the past years by the Oil and Gas community, geoscientists face many challenges while trying to solve complex problems related to the E&P chain. Three of the main ones are (1) the integration of such important amounts of data, (2) difficulties in managing scaling while moving from large basin scale exploration to restricted field scale production and finally (3) ways of de-risking the petroleum systems elements through innovative approaches in order to localize leads, characterize reservoirs and later enhance production. In this communication we explore the forward stratigraphic modelling advances used to integrate wide multi-disciplinary and multi-scale datasets along source to sink profiles. DionisosFlow forward stratigraphic model is a deterministic process based tool that allows reproducing the interaction between subsidence, eustatic variations and the sediment routing systems that represent the integrated behavior of “source to sink” geomorphologic processes comprising sediment erosion, transport and deposition from catchment areas towards the shelf, slope and basin floor. The use of geomorphological, geological and geophysical multi-scale constraints in Forward Stratigraphic Models has shed light on the various interactions between the local, regional and global scale driving mechanisms (e.g. tectonic versus thermal subsidence rates, accommodation, climate evolution, drainage systems activation, eustatic variations amongst others) that influence sediment transport and deposition along evolving landscapes. The need for more efficient and faster ways of assessing the sensitivity of stratigraphic models with regards to all these driving mechanisms lead to the development of an integrated workflow applicable at basin and reservoir scale. The coupling of DionisosFlow with CougarFlow offshore Novascotia, the Gulf of Mexico and Trinidad allowed the generation of automated multi-realizations using a Latin-hypercube experimental design to measure the impact of varying uncertain environmental parameters on the reference-case geological model. The use of response surface methodologies permits a more robust sensitivity analysis assessment of environmental parameters on sediment texture/facies and thicknesses. 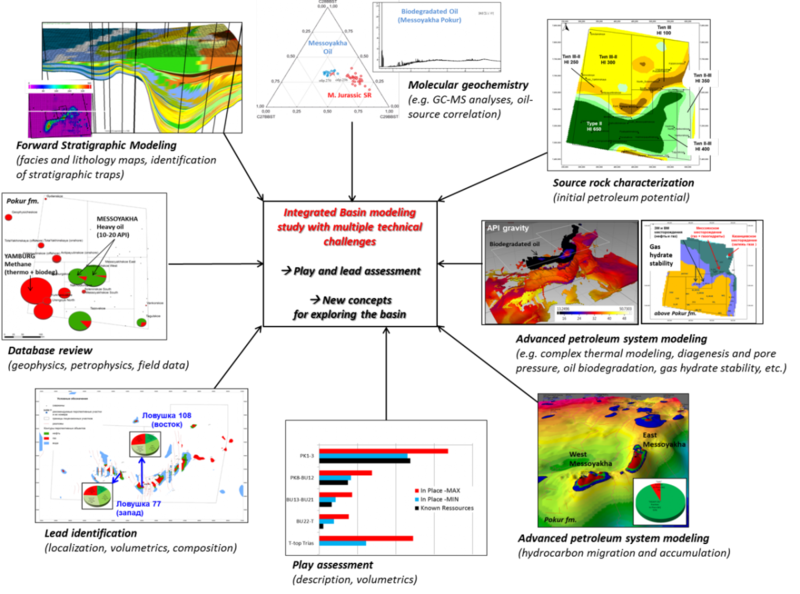 The coupling of multi-scale stratigraphic models with response surface methodolologies and multi-realization opens new opportunities to predict the lateral and vertical extent of sedimentary facies and thus de-risk petroleum systems elements of various geological systems at a global scale from an exploration to production perspective. 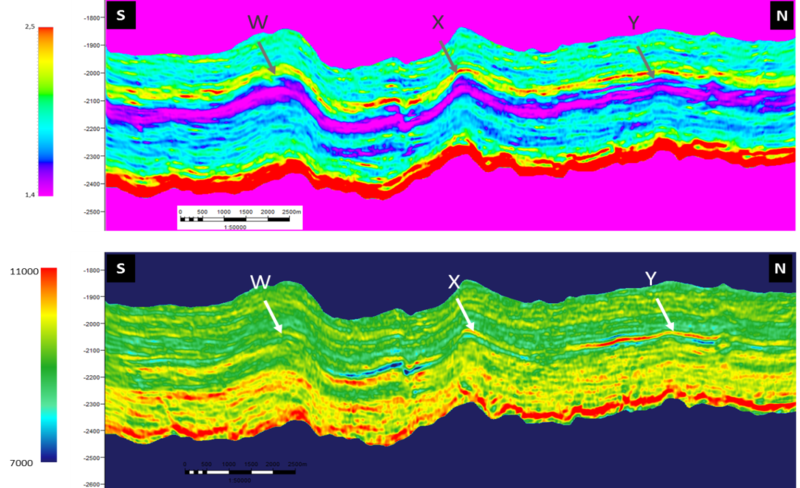 Benefits of forward stratigraphic modeling in petroleum exploration . . . In Petroleum Exploration, understanding the lithological and stratigraphic basin architecture is a key component of a successful resource assessment. We here propose a constrained 4D stratigraphic model to better assess lithology variations and the exploration risk in an integrated exploration workflows. This workflow is conducted on the underexplored Orphan / Flemish basins, located offshore Newfoundland, Canada. The initial geological and geophysical work consists in a well and seismic sequence stratigraphic analysis. It aims at understanding and refining the sequence stratigraphic framework of the basin. Interpreted paleoenvironments are firstly defined on 2D seismic sections. This stratigraphic / geomorphologic framework is then transposed to the whole study area using the complete seismic and well dataset to create conceptual Gross Depositional Environment (GDE) maps per main stratigraphic units. Ultimately, the G&G interpretation helps to constrain a numerical forward stratigraphic model. The conceptual GDE maps, and more specifically their estimations on paleobathymetry, sedimentary source dynamics, pathways and sedimentary object styles, are dynamically tested using the 4D forward stratigraphic modelling tool DionisosFlowTM. This model, which takes into account the interplay between sediment supply, transport and accommodation change, allows the paleoenvironment interpretations to be tested. Eventually, the model provides a geocube with various environmental properties such as lithologies (volume of sand and shale) but also water energy; bathymetry, etc. - An optimal outline of the petroleum play definition: the defined plays are based on 4D (spatial and temporal) distribution of main organic-prone sediments, reservoir and seal with respect to the stratigraphic framework (regression/transgression trend). - A detailed lithological input within the 3D petroleum system model skeleton for further hydrocarbon generation/expulsion/migration & entrapment modelling. This paper was prepared for talk at the Geological Society Event – Fold and Thrust Belts: Structural style, evolution and exploration, held in London, UK, 31 October - 2 November 2017. Petroleum system modeling is today recognized as a critical step in exploration workflows. However, fold and thrust belt regions are particularly challenging as most of basin modeling tools do not accurately manage the combination of lateral and vertical tectonic displacements. In basins where hydrocarbon expulsion from source rocks is prior or simultaneous to compressive tectonics, there is a need for a more accurate modeling approaches integrating active faulting, folding and fluid flow (hydrocarbon and water). In these complex areas indeed, the reconstruction of basin burial and geometry, faults connectivity and fluids movements through time implies accounting for the actual horizontal deformation, and requires an appropriate methodology for explorationists. New workflows linking structural-restoration packages to basin modeling tools have thus emerged in the industry in the past years, albeit with strong limitations which impact their operational use. This communication discusses these limitations from a practical point of view and presents a new workflow intending to overcome these problems with a new 2D kinematic tool designed specifically for basin modeling purposes. Honoring both structural geology and basin modeling constraints, this tool aims at producing easily and rapidly consistent geological scenarios to feed new generation basin simulators. In addition to classic geometrical reconstruction methods, a new mechanical engine taking into account compaction and rock mechanical properties is available along with several deformation models. The ability to provide geologically valid results in all structural contexts and an intuitive definition of deformation parameters to optimize productivity constitute the core of the tool. Dynamic mesh deformation is guaranteed through the model topology preservation as restoration work progresses. 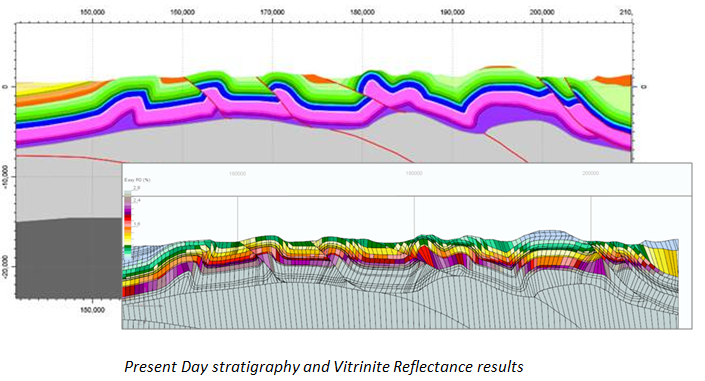 An application case from the Kurdish foothills is used to illustrate this new technology and its ability to quickly generate tens of paleo-sections continuously deformed for basin modeling simulation. Foothills are typical regions where classic approaches do not apply and where explorationists use, when possible, time-consuming methodologies to evaluate petroleum systems. This example shows to what extent this new approach allows easily increasing basin models structural complexity while meeting the industrial operations constraints, both in terms of execution time and results quality. Pore Pressure in Jurassic and Cretaceous of Kuwait: concepts . . . This paper was prepared for poster at AAPG held in London, UK, 15-18 October 2017. Pore Pressure regimes result from complex interactions between various phenomena from micro to regional scale, controlling sediments porosity-permeability distribution, fluids characteristics and expansion. Our objective is to present a case study where basin modelling has been used for understanding and predicting the pressure field at regional scale; it covers both onshore and offshore Kuwait, from the Precambrian basement to the surface. Although Kuwait is a mature basin, the occurrence of strong overpressures (20ppg and more) within and beneath Gotnia-Hith evaporitic deposits (Kimmeridgian-Tithonian) is not fully constrained. In addition, above the salt, the distribution of overpressures in Northern Kuwait is still poorly understood. The model is calibrated with field data and geomechanical analysis of well reports. It shows that the main cause of overpressure at basin scale is the confinement of pre-salt Jurassic units. Formation waters mobilized by the sedimentary compaction (mechanical and chemical) and other fluids generated by diagenetic processes and catagenesis must escape the system. The model proves the importance of vertical fluid migration through low permeability faults and discontinuities in the Gotnia-Hith Formation. Several of these discontinuities have been mapped for the first time according to their directions and vertical extensions, thanks to a dedicated geophysical analysis performed in parallel. Local “salt windows” exist both in Burgan and Sabiriyah-Raudhatain areas. The model also shows that fluids “injected” in low porous Lower Cretaceous carbonates “propagate” the overpressure above the salt, locally forming “pressure plumes”. These results have of course consequences on our understanding of imbricated petroleum systems feeding super giant oil fields in the area. 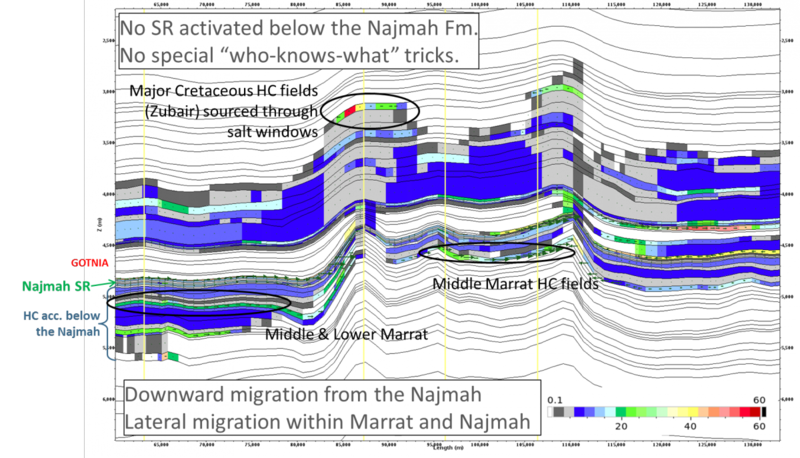 In the first place the model demonstrates that hydrocarbons generated by the prolific Najmah source rock (Callovo-Oxfordian, below the salt) can feed Marrat reservoirs (Middle Jurassic) and contribute to the charge of several Cretaceous plays. Finally basin modelling results have been used as boundary conditions for a high resolution geomechanical finite element modeling of the pressure field within the Gotnia-Hith formation itself, spatial variations of mechanical properties being defined through seismic characterization. Depending on the scale and on involved mechanisms, only integration of various approaches provides reliable enough prediction of pore pressure. Foam injection: calibration methodology from laboratory experiments . . . This paper was prepared for presentation at EAGE held in Paris, France, 12-15 June 2017. Assessing foam injection feasibility implies the design of a foam formulation and tests at core-scale in presence and absence of oil. In the objective of designing a pilot, a numerical model must be constructed; but foam modelization is difficult as it is influenced by various parameters. It is thus necessary to history-match core-flood experiments according a precise methodology. Numerical simulations are carried out step by step following the respective sequences: co-injection of water and gas in absence of oil (phase 1), foam injection in absence of oil (phase 2), co-injection of water and gas in presence of oil (phase 3) and foam injection in presence of oil (phase 4). History-match of sequences 1 and 2, allows calibrating water-gas relative permeabilities and foam model influencing parameters (gas mobility reduction, foam concentration, injection velocities, appearance criterion). During history-match of sequences 3 and 4, the water-oil and gas-oil relative permeabilities and, foam disappearance criteria in presence of oil are calibrated. Applying this methodology in this work, we show how we accurately reproduce laboratory measures. The transition to the field-scale shows the uncertain behavior of some foam parameters, important aspect of the study as it influences to the pilot profitability evaluation. This work aims at explaining the combination of geological and physical processes that may induce downward migration in a basin, a phenomenon which is still debated among the community. Based on the example of the Jurassic sequence in Kuwait, we propose 4 circumstances in which downward migration is possible: 1/ Juxtaposition of source rocks and older reservoirs along geological discontinuities such as faults; 2/ Juxtaposition of source rocks and older reservoirs along steep slopes (e.g. the flank of an anticline); 3/ “Fill and Spill” process (generated hydrocarbons saturating the source rock first, then reaching underlying formations if there is no other “escape way”); 4/ “Fill and Spill” process enhanced by the water flow and/or capillary process. Petroleum system modelling (using the Darcy’s Law) shows that in fact downward migration results in a combination of different processes. It proves that the Najmah-Marrat petroleum system is physically possible. This result is compatible with oil-source correlations (geochemistry). Complex downward migration paths are particularly sensitive to parameters which are not often properly constrained in sources rocks and in low porous carrier beds: petrophysical properties, fractures and faults distribution, facies distribution. Understanding downward migration requires cogent basin models fully integrating physics and geology. Integration of forward stratigraphic modeling and petroleum system modeling in Northeastern West Siberia . . .
Northern part of the West Siberian petroleum basin attracts much of scientific attention focused on exploration studies. Characteristics of imbricated petroleum systems and relations to giant oil and gas fields are far to be clearly understood. This integrated study achieved in 2014 was based on the basin modelling of Southern Gydan Peninsula, Messoyakha Arch and Bolshekhet Depression. It was performed for petroleum potential assessment, reservoirs and seals mapping, as well as evaluation of Lower Cretaceous in place resources. Comprehensive workflow included 3D forward stratigraphic modelling (Dionisos) used for detailed sedimentary facies distribution and stratigraphic traps identification, and 3D petroleum system modeling (TemisFlow). The geochemical database included pyrolysis (source rocks analysis), and GC-MS analysis (oil-source correlations). Numbers of complex processes were taken into account such as rifting events, climate changes and glaciations, Tertiary cryosphere formation and degradation, erosions, biodegradation processes, impact of the diagenesis on the pore pressure prediction. The study enable to assess the “yet to find” around the Messoyaha Arch. It also improved our understanding of petroleum systems at basin scale, confirming the importance of the Bazhenov source rock and highlighting the role of the biodegradation in the distribution of oil and gas fields. Erwan Le Guerroué , Pierre-Yves Chenet , Bertrand Lebreuilly , Paul Jermannaud , David McCallum , Victoria Mitchell , Nicholas Montevecchi , Ian Atkinson , Richard Wright . The underexplored West Orphan Basin appears prospective for oil and gas, after new regional seismic data uncovered a large play trend in the Lower Tertiary sands, indicative of turbiditic fan complexes. The objective was to provide petroleum resource estimates for the area using seismic reservoir characterization, and 2D/3D basin modelling for play risk analysis and volume estimates. A seismic inversion and characterization was performed to discriminate sand probability. Some Tertiary and Cretaceous sands appear to have high porosity (~30%) with a clear indication of the presence of hydrocarbons, most probably light oil. Regional sequence stratigraphy work coupled to a forward stratigraphic model (DionisosFlow™) helped to map the extension of reservoirs, carrier beds and seals. After calibration of the thermal and fluid flow regime temperature, maturity and pressure, an integrated 3D model was built using TemisFlow™ to estimate the oil and gas charge in the potential traps (stratigraphic and structural) in the various plays. The resource assessment of the Orphan area demonstrates a potentially prolific petroleum system. The uncertainty on HC volumes is given by the distribution of unrisked volumes in place. The range varies from 12.9 BOE to 45 BOE. The Probability of Geological Success is estimated to 16%. Paul Jermannaud , Erwan Le Guerroué , Jonathan Pitz , Thibauld Pichot , David McCallum , Victoria Mitchell , Ian Atkinson , Richard Wright . A sequence stratigraphic analysis coupled with a 3D forward stratigraphic model was performed in the Orphan Basin (NL, Canada). It aimed at understanding the sedimentary and stratigraphic infill of the basin and to define potential plays. The basin sequence stratigraphic architecture was initially defined using two composite 2D seismic sections. This stratigraphic framework was then applied in 3D space using the complete seismic and well dataset to create eight (8) conceptual Gross Depositional Environment (GDE) maps. The conceptual GDE were then numerically tested using the 4D forward stratigraphic modelling tool DionisosFlow™. The model allowed the paleoenvironment interpretation to be greatly refined, and the lateral and vertical extension of potential reservoirs on the shelf margin and within large turbiditic complexes to be identified. Transgressive intervals were highlighted to be favorable to the deposition and preservation of organic-rich sediments. The 3D stratigraphic grid results were used to assess the exploration geological risk, considering reservoir/seal presence and effectiveness. Sand and shale distribution in the 3D stratigraphic model is available laterally and vertically in terms of Net sand, Net to Gross and as a minimum continuous thickness. Reservoir / seal couplets, defining plays, were risked (Common Risk Segment mapping) with accurate spatial definition. Uncertainty analysis in forward stratigraphic modeling . . . This paper was prepared for a poster session at EAGE held in Paris, France, 12-15 June 2017. Traditionally, forward stratigraphic models have been used to better assess vertical and lateral facies variations with regards to several environmental parameters affecting both siliciclastic and carbonate realms (i.e., eustasy, carbonate production versus depth and time, wave energy and direction, drainage systems characteristics, subsidence amongst others). Models were generated manually and several scenarios related to input parametrization were tested. Such manual and lengthy tasks hindered the complex assessment of uncertainties and risks related to the geological model while sensitivity of interacting input parameters could not be manually assessed. 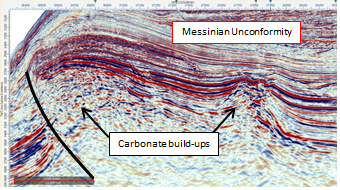 In order to answer the Oil and Gas industry needs, a new approach has been developed combining forward stratigraphic modeling using DionisosFlow and automated multi-realization and uncertainty analysis using CougarFlow tools. This innovative approach was tested on siliciclastic, carbonate and mixed systems at basin and field scales allowing the end user to simulate hundreds of automated scenarios using a Latin Hypercube Experimental design and a response surface approach. This integrated work tackles challenges faced in classical stochastic geological modelling by providing a stratigraphically-constrained and process based approach of the facies distribution in reservoir and basin models. Mesozoic and Cenozoic offshore shallow water carbonates . 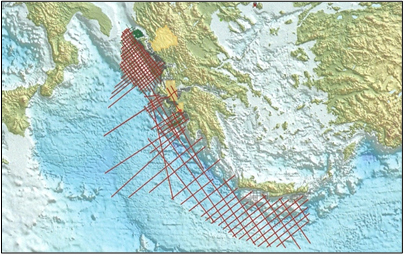 . .
Mesozoic and Cenozoic offshore shallow water carbonates of Northwestern Greece: seismic expression of an emerging play. Arnaud Fournillon , Véronique Carayon , Jonathan Allard , Øystein Lie , Sofia Stamataki  and Spyridon Bellas . 4. Oil & Gas Expert of the EFG, Upstream Expert - Hydrocarbons W/G, Ministry of Reconstruction of Production, Environment & Energy, Hydrocarbons Directorate-Greece. Carbonate reservoirs are widespread throughout the Mediterranean Sea. Platforms and build-ups represent well-known reservoirs of the Western Mediterranean for both Mesozoic and Cenozoic, whereas they represent proven and promising discoveries in the Eastern Mediterranean. 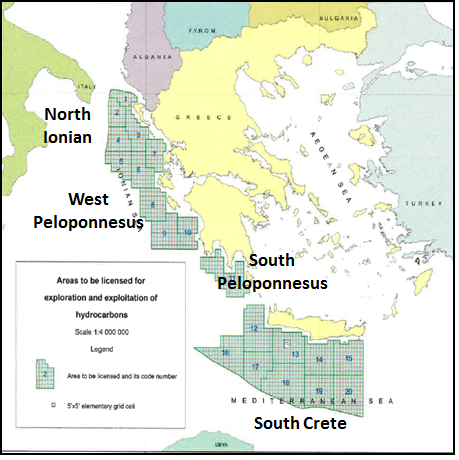 The North Western Greece offshore lying in the less known Central Mediterranean represents one of the last Mediterranean offshore frontiers. This study aims at proposing new carbonate plays in this area and inferring their reservoir potential. It is based on their seismic expression and literature analogue review. These carbonates are represented by Mesozoic platforms and build-ups from Jurassic up to Upper Cretaceous, and mostly by build-ups from Eocene to Miocene. The Mesozoic carbonates develop in passive margin condition. They generally form wide rimmed platforms and atoll-like structure. These structures are topped by erosional surface and surrounded by resedimented carbonate belts. The Cenozoic carbonates are quite unique in the Mediterranean as some are formed during the Alpine orogeny climax. This particular geodynamic context favors pinnacle-like structures and isolated build-ups. Local and worldwide analogues, in terms of age, seismic facies and geodynamic context, show that both Mesozoic and Cenozoic shallow-water carbonate represent valuable play. Risk Analysis in Unexplored Areas: Application of a Response Surface . . . This paper was prepared for presentation at AAPG held in Houston, United States, 2–5 April 2017. Coupling the evolution of thermal and pressure regimes through time, petroleum system modeling is recognized as a key tool to estimate source rock maturity and hydrocarbon expulsion timing in unexplored basins. However, most of the data used in such basins is subject to uncertainty which becomes critical in frontier areas where very little information is available for calibration. The potential range of variation of input parameters leads to a high variability of the basin modeling simulation results and there is definitely a need for sensitivity and risk analysis in such studies. Traditionally, risk assessment is done performing multi-realizations with a Monte-Carlo sampling which requires a lot of time, sometimes months, when hundreds of simulations are required on a high resolution model. To overcome these delays unaligned to the E&P industry constraints, we here present a new workflow linking basin modeling to a dedicated uncertainty analysis tool based on response surfaces. If the later technology is commonly used in reservoir engineering, it is quite unknown in exploration. In this approach, a set of simulations – the experimental design – is used to compute response surfaces that provide very fast estimations of the simulator outputs for any parameter values. The uncertainty study is then conducted from the response surface predictions only. A limited number of simulations is generally sufficient to obtain reliable estimations. The total time required to estimate the risk associated to the model uncertainties is thus drastically reduced. The passive margin offshore Canada is used to illustrate this workflow. The focus is made on the deepest Jurassic source rock and the uncertainties linked to its maturity assessment as well as its petroleum potential: depth, surface temperature and basal heat flow variations, initial TOC and HI, etc. Two calibration wells available on the platform are used in the study. A sensitivity analysis is first performed to identify the most influential parameters in the different areas of the basin. A propagation is then realized to estimate the risk on the source rock maturity, the expulsion timing and expelled quantities. Applied to the full source rock unit and not only at a single well location, this approach provides relevant probability maps critical in the decision-making process. Integrated Multi-disciplinary Forward Stratigraphic Modelling Workflow . . . This paper was prepared for presentation at the SPE Middle East Oil & Gas Show and Conference held in Manama, Kingdom of Bahrain, 6–9 March 2017. With the continuous acquisition of worldwide multi-disciplinary datasets, geoscientists face the need for more integration. 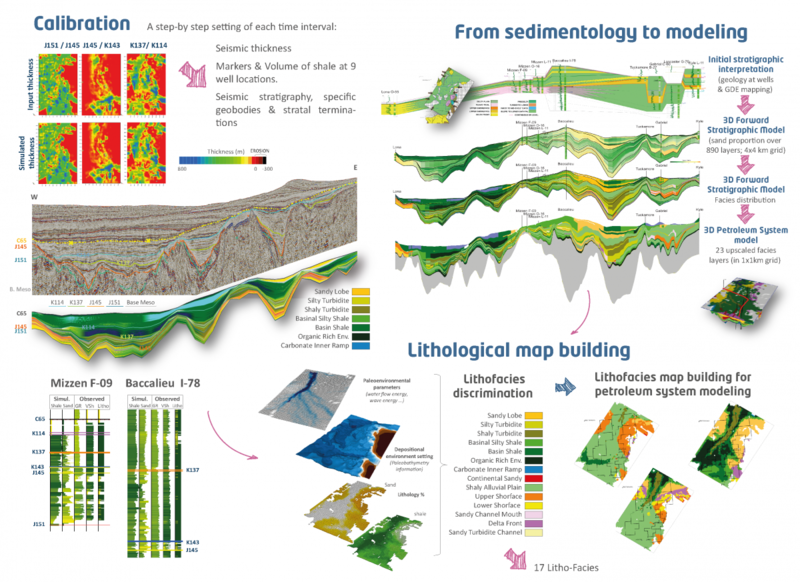 The combination of diverse expertise and multi-scale datasets has lately been supported by a fast rise in technological advances in data acquisition and processing (e.g., well logs, 3D seismic inversion and characterization) as well as by integrated 4D forward stratigraphic and basin modeling approaches. This work discusses the results of innovative methodologies developed in order to tackle rising challenges linked to the exploration of new hydrocarbon resources. The use of geomorphological, geological and geophysical constraints in process-based forward stratigraphic models shed light on the complex driving mechanisms that influence sediment transport and/or production and deposition along continuously evolving landscapes. The impact of subsidence rates, accommodation, climate evolution, drainage systems as well as eustatic variations on sedimentary bodies geometries and associated facies is investigated in various depositional settings (continental, transitional and marine). Lateral and vertical facies variations are consequently modelled taking into account the diversity of impacting environmental parameters. Coupled with petrophysical analysis as well as seismic inversion and characterization, this approach permits a 3D prediction of lithology, TOC and porosity distributions for the generation of integrated structural, facies and kerogen maps used in basin models in order to simulate the impact the architectural and thermal evolution on source rock burial, maturation, hydrocarbon generation, migration and trapping. 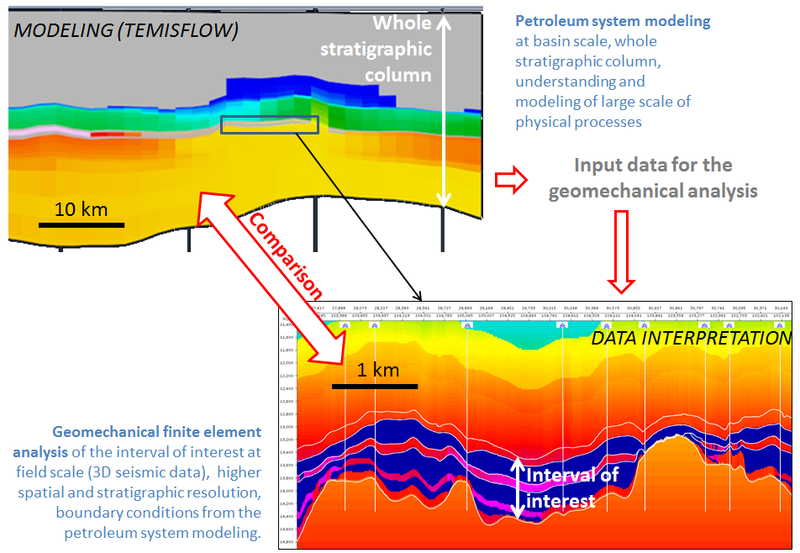 These workflows set new grounds for the generation of Play Fairway Maps, Common Risk Maps for the different petroleum systems elements (reservoir, seal, trap and charge) as well as Composite Common Risk Maps permitting to produce innovative ideas and reflections around the exploration and production of hydrocarbon resources. Surfactant-Polymer Flooding: Chemical Formulation Design and Evaluation . . .
Surfactant-Polymer (SP) flooding is an Enhanced Oil Recovery (EOR) process that can lead to incremental oil recovery through two mechanisms: reducing oil/water interfacial tension (IFT) to decrease residual oil saturation and increasing the viscosity of the displacing fluid to improve overall sweep efficiency. IFT reduction allows better oil recovery by overcoming capillary effects while the increased viscosity of the displacing fluid allows a more homogeneous sweep of reservoir oil. Implementing chemical flooding in reservoirs with relatively high temperature and in-situ salinity (> 200 g/L) is somewhat challenging. This paper describes the extensive laboratory work performed for the light oil Raudhatain Lower Burgan (RALB) reservoir (180°F/82°C) in Kuwait. Reservoir fluids were thoroughly characterized to preselect the most suitable chemicals for the SP process. Reservoir crude oil was analyzed and recombined with gases (C1-C3) based on reported Gas-to-Oil (GOR) ratio to reproduce the oil in-place at original reservoir conditions in terms of pressure, temperature and oil composition. A shift of the live oil Equivalent Alkane Carbon Number (EACN) was noticed compared to dead oil EACN. Numerous surfactants were screened based on three main criteria: solubility in the envisioned injection brine, ultra-low oil/water interfacial tension and chemical adsorption on reservoir rock. Different brine types were considered and the use of adsorption inhibitors was also investigated. Furthermore, polymer screening, involving temperature resistant polymers, was conducted by means of viscosity, long-term aging and adsorption tests. Polymer compatibility with the selected surfactants was also evaluated. The selected SP formulation was further evaluated through a series of coreflood experiments mainly based on chemical adsorption on reservoir rock and incremental oil recovery and an injection strategy was designed thereof. Laboratory results obtained thus far are encouraging and provide a systematic methodology to design surfactant-polymer injection in high temperature, high salinity and light oil reservoirs that are similar to the RALB reservoir. Additional techno-economic evaluation is in progress in preparation for field-scale deployment of surfactant polymer injection at the RALB reservoir in Kuwait. EACN (Equivalent Alkane Carbon Number) determination experiment. 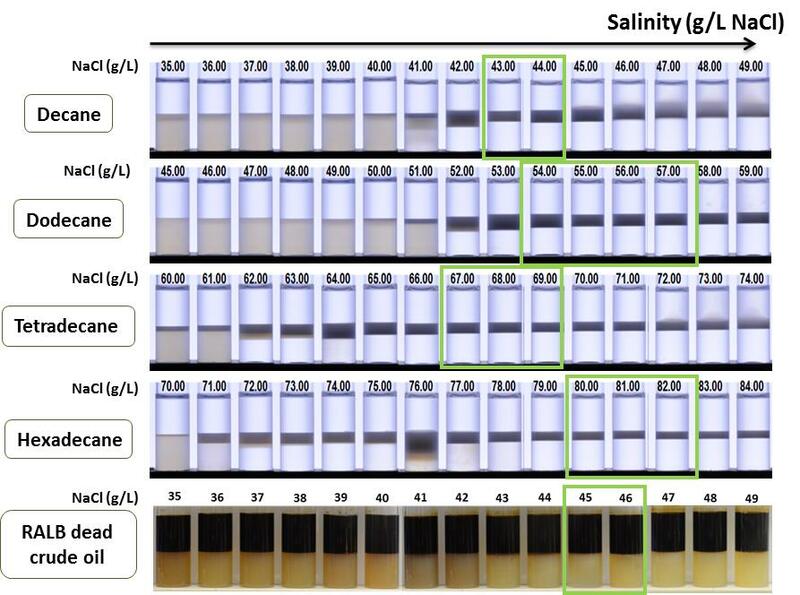 Salinity scans using a reference surfactant formulation with model alkanes and RALB dead crude oil. Series were imaged after 11 days at 82°C/180°F. 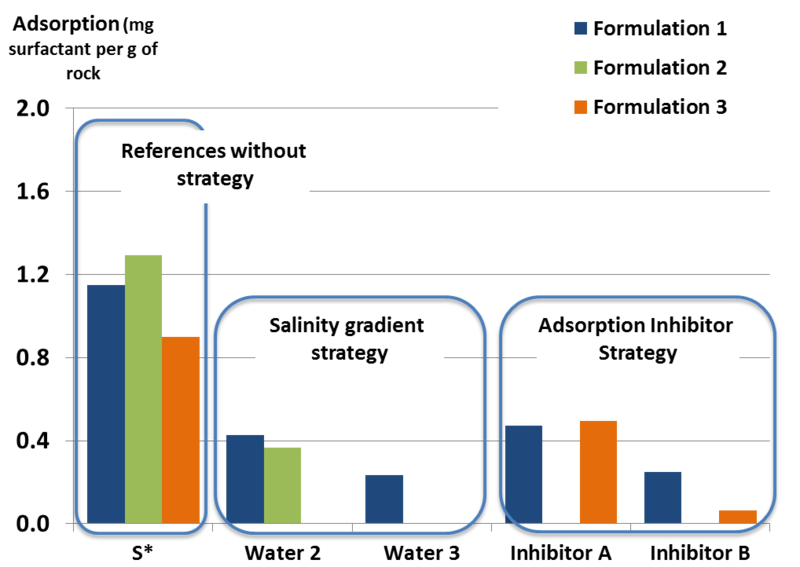 Optimal salinities (S*) are indicated by green rectangles. Static adsorption tests results for Formulations 1, 2 and 3 using crushed reservoir rock and different brines. Multi-Reservoir Fast-Track Evaluation of EOR Potential Using Conceptual . . .
- Identify the most promising reservoir(s) on which further efforts on EOR development should be concentrated. - Economic analysis to calculate usual indicators for each EOR scenario. The methodology was successfully developed and applied to 10 light-oil reservoirs. Up to 3 water-based or gas-based EOR methods were simulated per reservoir. Since thermal methods were discarded during a preliminary screening, they were not considered at this stage of the study. No laboratory analysis was performed during this study. For each EOR process, parameters were varied within their range of uncertainty in order to scan a wide range of possible scenarios. Consequently, around 50 scenarios were simulated for each EOR process and reservoir. Scenarios giving promising results at the simulation scale were extrapolated to the field scale and yearly-based economic analysis was performed for each of them. This economic analysis used estimated CAPEX and OPEX, consistent with each reservoir conditions and extent. The outputs of this economic analysis were common indicators such as net present value and profitability index. These indicators were used to perform a ranking of the most economically promising EOR processes of 10 reservoirs. Among these reservoirs, 3 were identified as very promising for chemical EOR application, and 1 for a gas-based method. As a result of this work more detailed feasibility studies, including laboratory work, are now considered for the most promising reservoirs. 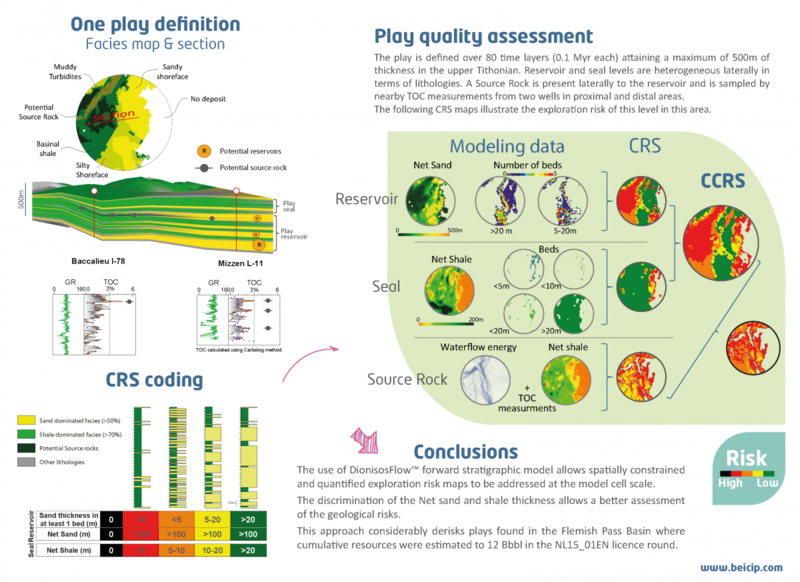 Though the EOR simulations and the economic analysis techniques are not novel in this workflow, this advanced EOR screening approach is innovative since it provides economic indicators, in addition to the usual recovery factor, which helps prioritise reservoirs regarding their EOR potential. This methodology stands between analytical workflows which estimate recovery (usually without capturing geological heterogeneities nor providing economic indicators) and more detailed, time-consuming and more expensive workflows with large-scale reservoir simulations. Cumulative oil production profiles for reservoir A at the scale of the conceptual model grid. Left plot displays the waterflood base case (in black) and several surfactant-polymer flooding cases (in red) profiles among the 54 that were simulated. Right plot displays the waterflood base case (in black) and several immiscible gas injection cases (in red) profiles among the 45 that were simulated. Simulation of Chemical EOR Processes for the Ratqa Lower Fars . . . This paper was prepared for presentation at the SPE International Heavy Oil Conference and Exhibition held in Mangaf, Kuwait, 6–8 December 2016. This paper presents the results of a multi-scenario approach that involves the simulation of chemical EOR processes (polymer- and surfactant-based) for the Ratqa Lower Fars heavy oil (200-1000 cP) field in Kuwait, in order to evaluate the viability of implementing an appropriate chemical EOR strategy. Both technical and economic results are discussed. 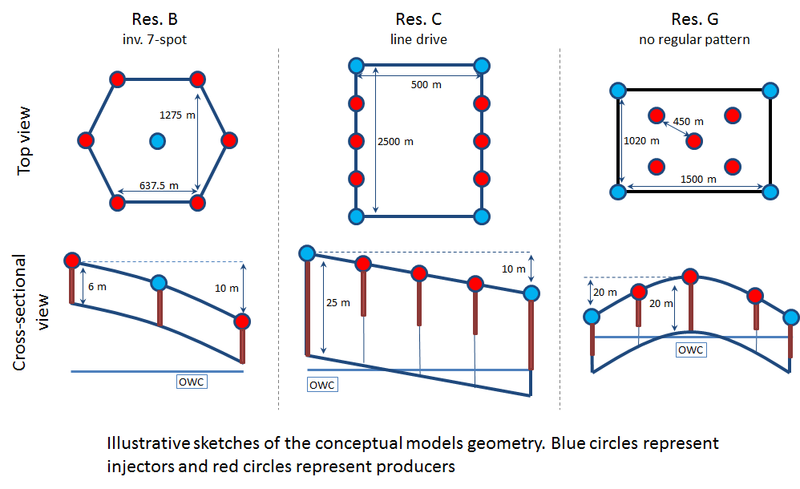 The approach used involves the simulation of various chemical EOR scenarios (injection of chemical slugs with different durations and concentrations) using several wells patterns (inverted 5-spot, inverted 9-spot, inverted 7-spot with vertical wells, line-drive with horizontal wells) covering various sizes in terms of area. Preliminary simulations of depletion and waterflooding scenarios were also conducted, as base cases to be compared to. 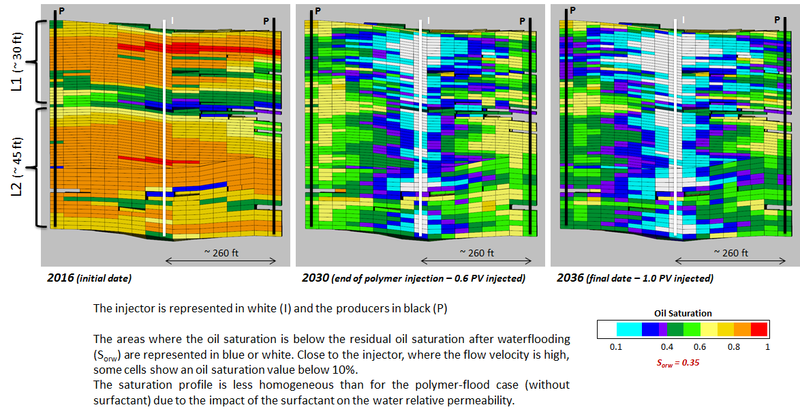 Hundreds of EOR scenarios were hence simulated and compared using economic indicators such as the final recovery factor and the cost of chemicals per additional barrel of oil produced, compared to the waterflooding base case scenario. 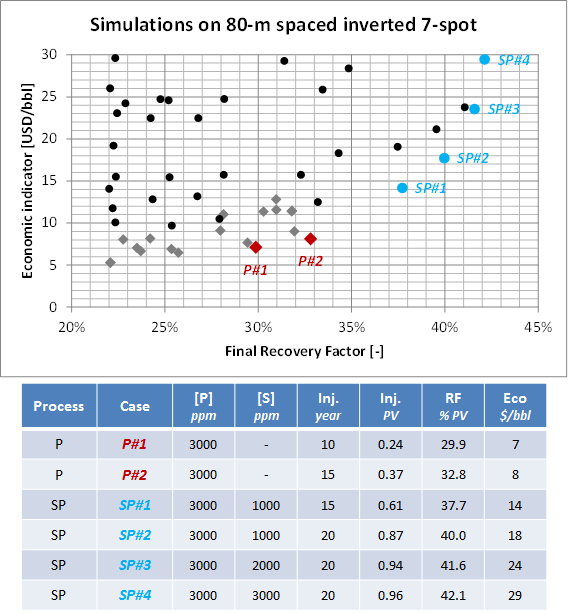 The analysis of the different simulated scenarios shows that due to injectivity issues (low maximum injection pressure to prevent the shale cap rock from being fractured), inverted patterns (inverted 9-spot and especially inverted 7-spot) had to be considered to enhance overall performance and reach promising recovery factors using chemical EOR methods. It is also shown that the impact of the pattern area for the same pattern type (inverted 7-spot configuration) is of paramount importance to the final recovery factor obtained after a fixed simulation duration (20 years in the present case). While the overall efficiency of each EOR process - in terms of recovery factor as a function of the injected solution expressed in pore volume - is kept similar when varying the pattern area, the pattern size is directly linked to the final recovery. Indeed when the pattern area is increased, a smaller volume (in terms of pore volume) of chemical solution can be injected in a fixed timeframe. Finally, the use of simplified economic indicators allowed comparing different EOR processes (polymer and surfactant-polymer) and potential patterns in order to find the most promising configuration in preparation for field implementation. The proposed approach is new as it presents and discusses for the first time the results of a detailed simulation study to evaluate the potential application of chemical EOR processes at the Ratqa Lower Fars heavy oil field in Kuwait. The results of this study are promising and clearly demonstrate the potential applicability of chemical EOR processes in similar heavy oil reservoirs. (1) Beicip-Franlab, 232 Avenue Napoléon Bonaparte, 92500 Rueil-Malmaison, France. Heterogeneous lithofacies distribution resulting into a complex rock-type model in shallow unconsolidated reservoir has a direct role on fluid distribution and trapping mechanisms. A systematic evaluation of these rock-types is necessary for proper reservoir characterization and modeling. In reality, the lithofacies leading to rock-types act as the building blocks to construct a realistic static model, which serves in the understanding of the dynamic behavior of the reservoir. During this study, 202 wells were selected across the field to capture the vertical and lateral heterogeneity of the reservoir, out of which 93 wells have cores. 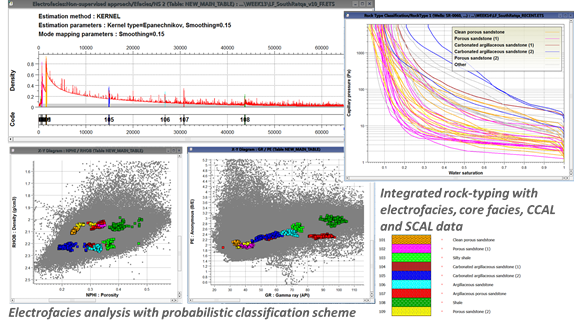 During a first step, a lithofacies prediction model was created from the core sedimentological description, X-Ray Diffraction (XRD), and wireline logs (raw and mineralogical logs) using probabilistic classification schemes. In a second step, petrophysical data like Routine Core Analysis (RCAL), Mercury Injection Capillary Pressure (MICP), were included to build rock-types associated with the different lithofacies. This integration workflow has resulted in a robust lithofacies and rock-type model consisting of nine lithofacies and five rock-types respectively. It was also noticed that silty non-pay and marginal pay reservoir have inadequate MICP data. Subsequently, two wells were selected and MICP data will be collected for improved and more confident modelling in future. This model assists to predict lithofacies and rock-types in un-cored wells provided a set of relevant logs are available. The integrated workflow ensures that the lithofacies and rock-types determined at the wells are consistent all over the study area. The identified lithofacies and rock-types will add great value in building a realistic reservoir static model since they are able to explain the fluid distribution pattern and the concept of barriers and baffles in the reservoir. This will also assist in optimized perforation and completion plans for the reservoir. Ultimately, the input data are readily available for future field-intensive reservoir characterization. This paper was presented at the SPE Annual Technical Conference and Exhibition held in Dubai, UAE, 26–28 September 2016. Rospo Mare is a heavy oil fractured karstic carbonate reservoir producing since the 80’s. Reservoir pressure is constant due to a strong aquifer tilted toward north east. The producing wells are systematically operated at critical rate to prevent water production (no water treatment installation). The paper is focused on the modeling of the fractures and the karst system in conjunction with an innovative history match approach used to match the forced anhydrous oil production and to represent the complex water position and behavior through time. As the main fracturing phase of Rospo Mare reservoir occurred before the karstification phase, the dissolution of the carbonates was guided by the existing fracture network. The karst system and the fracture network were modeled together thanks to a fracture model that includes several enlarged fracture sets and lineaments. The fracture modeling was also guided by the relative compactness of the matrix facies distribution. Because of limited data for fracture characterization, the dynamic characteristics of fractures, particularly the aperture of enlarged fractures, were fully considered as history match parameters. The history match approach consisted in using both the historical oil production and the prediction period to make sure that the wells were producing at their critical rate and ensure a realistic displacement of water at both field and well levels. This unusual strategy was necessary because of lack of data to constrain history match (no water and gas production, no pressure variation). Therefore the history match was performed by taking into account the prediction period through a do nothing case scenario. Based on the assumption of critical rate, a decline of the oil production rate is expected during the prediction period. This allowed assessing the vicinity of water at wells: both the rise of the water table and the coning effect at wells. The matched model successfully honors the water displacement and position at key wells including the last two side tracks drilled in 2012. The model allows a good representation of the reservoir physical behavior and provides a useful tool for piloting the field and assisting future decisions. The Grosmont Formation in Alberta contains one of the largest hydrocarbon accumulations of a carbonate reservoir in the world. It is also a highly fractured reservoir, where natural fracture networks have a key bearing on production and final recovery. The present fracture study focused on the Grosmont C and D units of the Saleski leases, where a steam injection pilot for the Grosmont was initiated in 2010 by Laricina Energy Ltd. and its partner, Osum Oil Sands Corp. This study aimed at characterizing the types, scales and organization of fractures in the reservoir units in order to build a representative fracture model and derive corresponding fracture properties to be used in dual porosity dynamic simulations. Detailed core and borehole image analyses revealed that fracturing in the Grosmont C and D units is organized into four sets of metre-scale joints and isotropic, centimetre-scale dissolution-related cracks. The joint density is controlled by facies. Dynamic data analysis revealed a link between mud losses, rock dissolution and facies types, especially in the Middle D unit. It also emphasized the fracture contribution to overall reservoir permeability. All of these findings were integrated to build a multiscale fracture model which, once dynamically calibrated, allowed computing fracture porosity, permeability tensor and matrix block sizes. These outputs are critical for thermal dual porosity dynamic simulations. Paper presented at XII Simposio Bolivariano, 26 to 28th of September, Bogota. and maturity level of the formation. These two parameters have a first order control on the volume of hydrocarbons generated and still retained in the formation. A basing modeling based methodology has been designed to allow estimating the hydrocarbons retention capacity of the formation and the composition of hydrocarbons still retained. Modeling of Microbial Gas Generation: Application to the Eastern . . .
within a 3D basin and petroleum system forward simulator. biogenic gas source rocks potential, and 2) A kinetic model of methane generation. to check the viability of a biogenic gas system. The Flemish Pass Basin recently gained attraction with the oil discoveries made in 2009 (Mizzen 0-16) and 2013 (Bay du Nord C-78). The area has also just closed its first scheduled land sale NL15_01EN in November 2015. This study reports an exploration risk assessment method based on a forward stratigraphic model capable of quantifying the reservoir, seal and source rock presence and effectiveness. A comprehensive stratigraphic / paleoenvironment interpretation of the Flemish Pass Basin serves as the basis to the construction of Gross Depositional Environment (GDE) maps characterizing paleoenvironments at time of deposition providing constraints on the paleobathymetry. When coupled with seismic thickness maps, these maps allow computing of accommodation maps (creation of available space for sedimentation), which are the main input for the numerical model. A forward stratigraphic simulation was performed using DionisosFlow™ in order to characterize the 3D sedimentary architecture of the basin and quantify the sedimentary volumes at the basin scale. This modelling was performed encompassing source rock, reservoir and seal, in sequential time steps of 0.1 Ma with a 4x4 km grid. For each time step, three main environmental parameters were taken into account: the accommodation (subsidence & eustasy); the sediment supply (with in situ erosion and drainage basins) and macro-scale sediment transport laws (equation of diffusion). The 890 layer model is calibrated to respect lithologies at wells, seismic thickness and seismic stratigraphic architecture. Based on the 3D volume reservoir, seal and source rock maps are calculated to provide quantified constraints on their presence and effectiveness. The reservoir maps are generated using cut off on net sand, the presence and cumulated thickness of individual sand beds thicker than 5 m and thicker than 20 m. The seal map effectiveness is generated by characterizing net shale maps with continuous layers of at least 5, 10 and 20 m. Source rock maps are generated by combining shale prone areas (net shale) with that of low water flow energy calibrated to TOC measurements at wells. Final exploration risks maps are obtained by combining reservoir, seal and source rock maps. 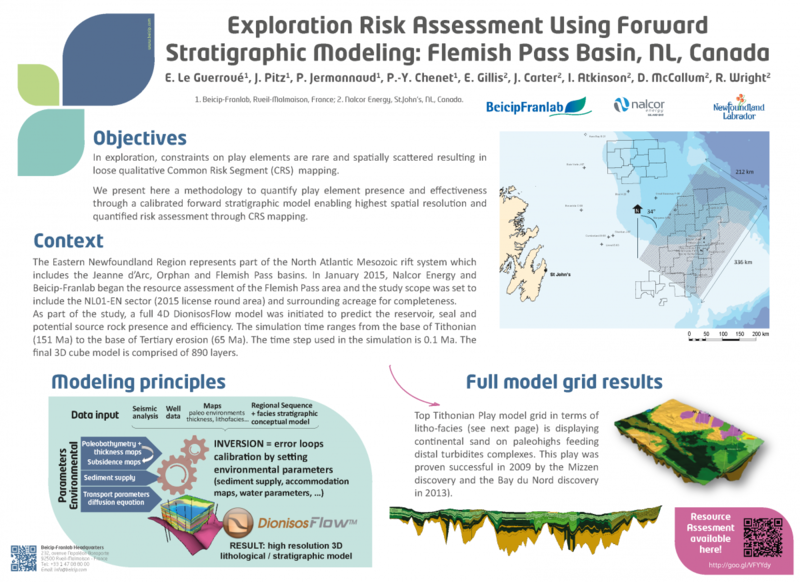 The use of DioniosFlow™ forward stratigraphic model grid allows spatially constrained and quantified exploration risk maps to be adressed at the model cell scale in poorly constrained exploration areas. 2. Department of Energy, Halifax, NS, Canada. 3. leptis E & P Ltd., Gerards Cross, Buckinghamshire, United Kingdom. Emerson Marfisi1, Francky Saint-Ange1, Adam MacDonald2, Matt Luheshi3, Laurent Cuilhe1. As part of its ongoing projects on hydrocarbon resources assessment, the Department of Energy and the Offshore Energy Research Association (OERA) have published in 2015 an integrated exploration study which is an expansion of the 2011 Play Fairway Analysis (PFA). In this context, a forward stratigraphic model was generated to reproduce the alternating carbonate-siliciclastic deposits of Hettangian to Cenomanian age present in the Shelburne Subbasin. The sedimentary cover of this basin can reach 15 kilometers with basal Triassic synrift deposits overlain by a thick salt cover and Jurassic to present-day sediments. The stratigraphic model was performed using DionisosFlow® and contains 70 x 50 cells with 4 x 4 km of cell size covering 56000 km2. Four major tectono-sedimentary events were reproduced by this model spanning 106 My. A Hettangian – Callovian event characterized by the onset of a carbonate platform at the position of the present-day shelf break. The backreef area was dominated by aggrading shallow marine/continental deposits. An Oxfordian – Tithonian event corresponding to the Jurassic Shelburne Delta prograded basinward supplying sandy sediments to the turbiditic systems in the basin. The distribution of depocenters in the shelf and basin area was strongly impacted by salt tectonics during this period. A sensible decrease on the clastic supply and a reactivation of the carbonate sedimentation on the shelf marked the final stage of this event during the Tithonian MFS. An episode of aggradation of carbonate deposits on the shelf and siliciclastic deposits at the backreef position took place during the Upper Tithonian to Valanginian period. A new phase of deltaic progradation was active during the Valanginian to Cenomanian period. This episode corresponds to the Cretaceous Shelburne Delta that mostly provided an important volume of potential reservoir facies to the basin area mainly represented by clastic and carbonatic turbidites. The model was calibrated using 2D seismic data and wells Bonnet P23 and Mohawk B93. The modeling results not only allowed a detailed 3D reconstruction of the margin evolution through time but also a prediction of the geometry and extension of reservoir facies in the still unexplored slope and basin areas. Facies distribution maps extracted from this model provided the stratigraphic framework for a petroleum system model generated for this promising new frontier basin (SW Nova Scotia 2011 PFA Expansion companion abstract). 2. Nalcor Energy, St. John's, NF, Canada. The Flemish Pass Basin recently gained attraction with major oil discoveries (Mizzen, Bay-du-Nord). This study reports a full Geological & Geophysical study aiming at constraining a Petroleum System model to access the hydrocarbon resource potential and risking for the area in the November 2015 license round. The architecture of the basin is constrained to provide a sound stratigraphic framework for the model. These input data allowed a DionisosFlow™ forward stratigraphic model to be built with 890 layers in a 4x4 km grid and spanning the Tithonian to the base tertiary at a 0.1 Ma resolution. The calibrated model returned a 3D grid of lithologies. The lithological grid was upscaled in 23 time layers to feed a 1x1 km grid TemisFlow™ Petroleum System model to assess in-place resources. Two main and proven source rock intervals are considered in the model: Kimmeridgian and Tithonian (type II-III). The timing of maturation and expulsion and migration is compatible with oil and gas entrapment in 4 main plays (Tithonian, Berriasian, Valanginian and Aptian). Hydrocarbon resources reach a cumulated 12 Bbbl of oil and 113 Tcf of gas unrisked trapped in the Flemish Pass Basin. Associated CRS mapping provided Probability of Success (POS) associated to these volumes. Dual Porosity, Dual Permeability Modeling of Carbonate Reservoir . . .
Exploration play fairways in the western Greece and southern Crete . . .